First, lose the perfectionism! By all means, check out Pinterest and other home websites for great storage ideas and inspiration. But keep in mind that the images you will see have often been carefully staged by professionals for that single moment in time when the photo is being snapped. Real storage spaces used by real people rarely look that way. So, rather than trying to recreate and live by some ideal you see on Pinterest, look for the common denominators in how professional storage-space organizers work. Think like a merchandiser. 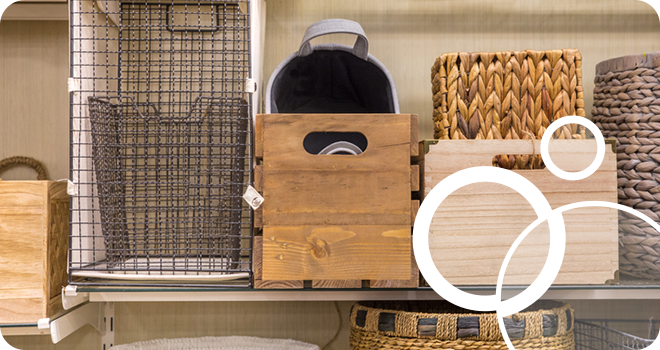 Much in the same way pro organizers focus on making storage spaces themselves look attractive, they also use common merchandising principles to display stored items in pleasing ways. This includes things like: placing taller items behind shorter ones; adding attractive labeling; grouping like items; precisely aligning items in rows or creating interesting shapes such as pyramids; grouping by color, or using color science to mix and order items (for example, placing in the same color-order as a rainbow). They also think constantly about how to repurpose all sorts of common household items for storage. For some truly ingenious ideas in this vein, simply add the word ‘‘hacks’ to your keyword search on Pinterest or Google. Leave plenty of free space. Another thing you might notice about professional organizing photos is plenty of white space. Storage experts recommend leaving up to 25% of a space free. That allows for more pleasing and functional arrangement of the items you’re storing. When you can easily locate and move items in and out of storage, the probability of that space staying tidy over time goes way, way up. Get handy. While you might be tempted to run out and drop a small fortune at a storage-solutions store, you’ll get more value by heading to a hardware store instead. If you don’t already have them, look for tools such as: a measuring tape, stud finder, hooks, clamps, screws, and a decent power drill. Having the right tools and learning how to use them properly gives you the power to literally ‘think outside the storage box’ and to repurposing all sorts of items—mason jars, baskets, hat boxes, metal buckets, corrugated tubing, and so forth that you might already have on hand or can buy at a very low cost. Raise it up. Especially in large, long-term storage spaces such as garages, basements, and attics, peg board—with a variety of hooks and clamps—is a pro favorite. Other items expert organizers often use creatively for optimizing large storage spaces include: PVC pipe segments, heavy-duty hooks (for hanging bikes, large handtools, etc. ), towel bars (for hanging things off or for storing things that come in rolls), bungie cords, magnetic strips, and shelving. Design it up. One thing you might notice about all those beautifully organized food pantries and garages on Pinterest is that someone has usually put considerable effort into making the storage space itself look attractive—a bright color or pattern on the wall; a creatively finished floor in lieu of drab cement; bright, modern lighting; and so forth. When you decorate a home storage space with the same level of attention you give to living spaces, people are generally more motivated to keep those spaces looking nice.